The New Testament of the Bible is a great part of the Bible to read. It starts with a focus on the life of Jesus and moves on to cover his followers after he dies, rises from the dead, and returns to heaven. Whether you are familiar with the Bible or just starting out, the New Testament unveils most of the essentials, and it provides the foundation for Christianity as it informs how we should live as Jesus’s disciples. By reading only one chapter a day, Monday through Friday, we can read the entire New Testament in one year. For the average reader this only takes three to four minutes each day. 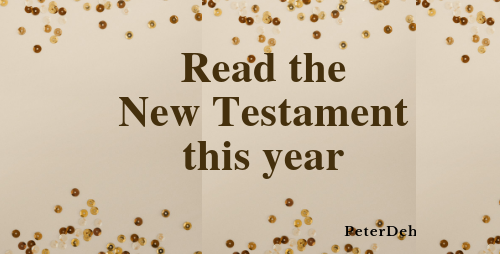 Download our 2017 New Testament reading plan to follow along with us. And then look for posts each Wednesday about that day’s reading. Join us as we read through the New Testament in 2017. You’ll be glad you did.